Children are not the only ones have the ticket to be sneaky, parents too can be crafty. When you’re cornered, you have to find a way out. I made almond milk this week. Not wanting to waste it, I forced myself to come up with new ideas to use almond pulp in my cooking. I added almond pulp to omelette – alongside celery and onion. 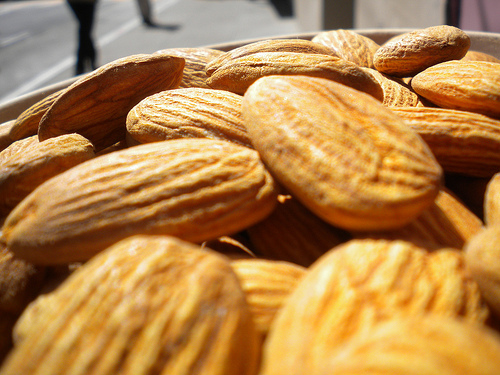 The almond didn’t alter the taste except that J noticed some brown dots made by almond skin. J and K gulped down the omelette happily like a baby. It then dawned on me that if your child does not like to eat whole foods like almond (or any other foods for that matter), this is a great way to do it. It goes to his stomach without him realizing it if you sneak in some secret ingredients. There’s another thing my wife has been making with leftover almond pulp: butterless almond cookies. The ingredients are flax seeds, almond pulp, rolled oats, molasses, and olive oil. Very yummy and I believe your kid can’t resist it. Almond pulp is just an example. You can hide anything you want your child to eat in your food. But honestly, I won’t sneak in any foods if I have a choice. I only do this as the last resort. I’d rather let the kids know and recognize what they are eating. While they eat healthy, they also learn about healthy foods. This is a lesson that lasts a lifetime.